Your Committee meets every other month throughout the year. If you have anything for discussion please let the Secretary know at least a week before so that it can be added to the agenda. 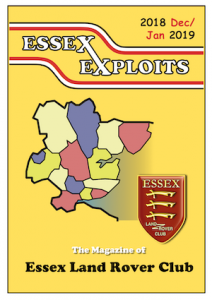 Exploits, the Club magazine - is published every other month and is the official voice of the Club. You will find up to date information about events and venues, together with member submitted articles etc. If you want to submit content, please let the Editor have this by the deadline shown. The magazine is published ready for distribution at the beginning of the next month. Social meeting in friendly Pub surroundings. Ample parking available. The 2019 National Rally is to be held at a site at Whaddon, which is just outside Milton Keynes in Buckinghamshire. It will be jointly hosted by Anglian LRC and Chiltern Vale LRC, with the support of other clubs who will be helping organise and run some of the events. The Rally runs from Thursday 23rd to Bank Holiday Monday 27th May 2019, with the event competitions starting on Saturday 25th May.